Last year’s Division 3 Senior Men’s Champions will be back this season. What’s more is that we are in full recruitment mode leading up to our 30th Anniversary season. We’re looking for men and women 18 years or over – no experience required – who want to stay fit and play this excellent sport. Take a look at the Become a Duck page for more info. For those who are new to the game and even for those who are already fans, you can catch some of the pros in action, the Six Nations tournament is mid-way through already. France, Italy, Wales, Scotland, England and defending champs Ireland are battling to see who can claim the title this time around. Some of the games are even available on YouTube! We’ll post our season schedule and social event dates as soon as they become available. To open, we will have a bagpipe player. She is awesome! Immediately following the games – around 4:30 pm- we will begin food service. The méhoui will include beef & pork, gravy, baked potato and green salad. 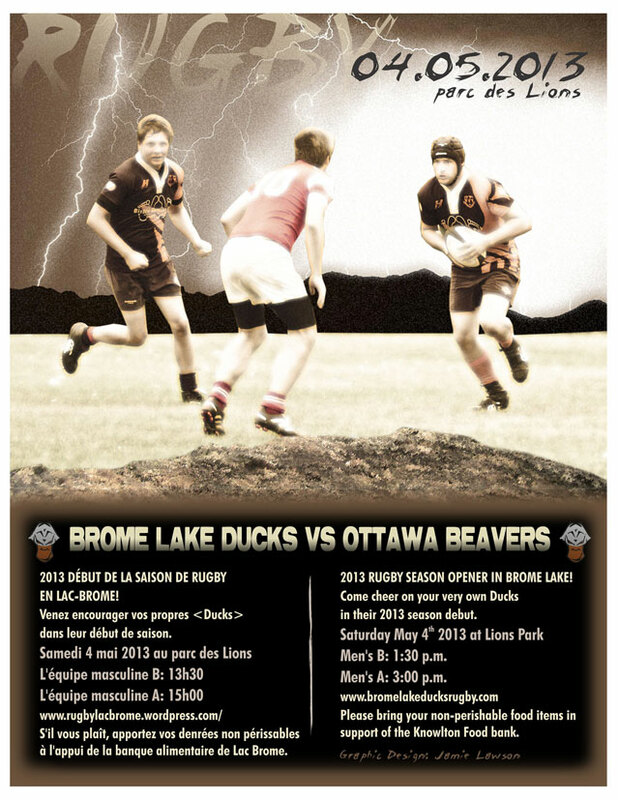 Cost of tickets is $25 and covers food, entertainment plus it supports your rugby club. Club members have tickets for sale but tickets will also be sold on event day. Coming out of retirement as a d.j., Jeff Greene will spin some tunes and get people strutting their stuff on our makeshift grass dance floor. It’s gonna be another epic social! Hope to see all our friends, family, inactive members and guests. All are welcome. After two months of practice and recruiting – the Ducks are ready to take flight on MAY 4 in the season home opener against the Ottawa Beavers. It’s sure to be a great game. 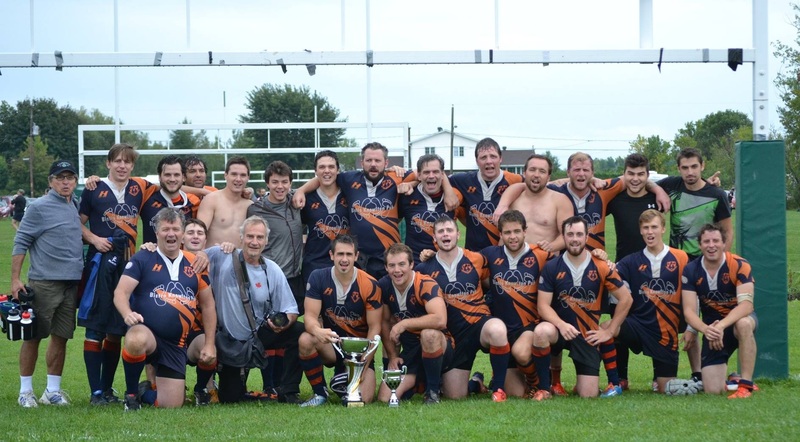 Ottawa will no doubt be coming hard in response the last year’s upset in the quarterfinals when our Men’s A team stole their scrum and scored to winin final minutes of the game. Who remembers that? Who wants to see the Ducks back in action? Rugby at the Lion’s Park means summer is officially here in Knowlton. Be there this Saturday May 4th at 1:30 for the reserves team and 3:00 p.m for the Men’s A team. Once again – as part of our community outreach program- we will be collecting non-perishable food items for the Knowlton Food bank. Bring a can or two. As we’re recruiting – what not a better time to communicate the history of our club. Have a look at it here – English section is up, French is on its way. Stay tuned. These accomplishments have been pieced together from a series of sources – many of whom have been playing for 15 or 20 years. Now, although we’ve done our best to provide as much detail as possible, it’s likely that some of the dates might not be entirely accurate or perhaps a little foggy. Just saying…this is a rugby club! We’d like to begin publishing photos of our past. That said, calling all players and fans: if you have any old photos like the one shown in the history section – scan and send them to bromelakeducks@hotmail.com. The older the better. We can’t build the future without understanding our past. It’s been a long winter – time off from rugby has meant time off from the blog. We’ll try and keep it a little more current this season. Shorter, more frequent posts are probably best considering how difficult it is to type on Sundays…We’ll leave it at that. You can draw your own conclusions. So where are we now with regards to the 2013 season? The AGM has been held, priorities remain the same as always – recruitment and fundraising to ensure the health of our club. After a great season last year – we want to continue with this forward momentum. Practices have begun! Good to see some familiar faces out there but better to see some new ones! Click here for details on when we practice. Check back soon for more details on our 2013 season schedule. The Ducks have certainly been busy since our last posting – both on and off the field. What with practicing, games, volunteering and fundraising, the men, women and families of the Brome Lake Ducks have had their plates full. All three teams continue to show sign of solid play and sportsmanship. The women are middle of their division with 3 wins and 3 losses. They’ve run up 84 points on their opponents and have given up 91. Keep it up ladies! We took a break for the Quebec seven’s tournament last weekend with our next games, this Saturday, July 21 against the TMR rugby club. A battle at home between the two dominant teams in the division. BE THERE JULY 21 TO CHEER US ON! As with every year, in collaboration with the Town of Brome Lake, the Ducks offer to lend a hand and put on a show for the kids at the Canada Day festivities. This year at the Lions Park, they managed a number of activities including Euro-Bungie, a mechanical bull, multiple bouncy-castles, a hefty-man toilet toss, frisbee, football, and rugby competitions, as well as a concession stand for those looking for refreshments and food. Coach Morad Kellal also put on a junior coaching clinic for his rugby school from Cowansville. The following weekend, on Saturday July 7, the Club threw its annual fundraiser/triple header game against the St-Lambert Locks. The day was an enormous success; not because of the matches won, but because of how a community can rally together to support its local rugby club. A sea of 200 people arrived on the Saturday to cheer on all three teams. Following the games, the Club put on a Méchoui dinner, awards ceremony and a kicking competition for Duck fans. Most notable in terms of support was the fundraising effort for one of our own, Lee Hudson, who was on his way to play in the U-19 Canadian Nationals in Calgary. All funds raised that day are put towards the development of the club. One last point, and the most worthy of mentioning – more fans continue to bring food in support of the Ducks on-going food drive for the Knowlton Food bank. To all of you who have participated and given in some way to our club, thank you kindly.